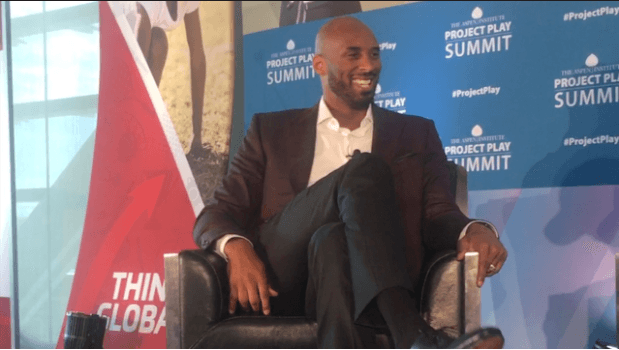 I had the pleasure of sitting front row at the Aspen Institute's Project Play Summit earlier this month - as Basketball Legend Kobe Bryant was interviewed by Keven Carroll in a discussion entitled "The Meaning of Play, with Kobe Bryant." Some important points are raised about early skill acquisition, the importance of learning how to THINK the game, and the role of coaches when it comes to providing a solid foundation. While the complete interview and transcript of this important conversation can be found at the SoccerParentResourceCenter.com, below is a portion of the interview (transcript below) where Kobe discusses growing up in Italy, and valuable lessons he learned from soccer that he brought with him to basketball. My coaches gave me the cake, I put the icing on it. So when you were growing up in Italy and the idea of a different sport culture, but also you didn't start off with basketball. What was that like for you? How did you make those adjustments? How did you actually fit in? How did you find a way to fit in? Well playing soccer. Most of the kids - you go to the park - and they're out there playing soccer all day long. Right? So that's where I made friends. I couldn't speak the language at the time but I could understand sport. I could understand the rules of the sport. That's how you start making friends and they start, all of them speaking Italian and using hand gestures and all this that and the other and it helped me catch up to the language pretty quickly. So one of the things that I realized and I've said this many times, we all speak ball. It's a language that we all get. ... right. But of course really like if you don’t get it on my foot right, I'm not reaching for that. Right. Doesn't matter where you go in the world people understand that. But the fact that you were already learning and I think this actually may have formed a lot of the way you approached basketball. You were learning from the game of football, the global game of football, soccer, and you're learning movements and everything there. How did that actually influence the way you played basketball when you first started out playing? Well it trains the brain to look at things in sets of threes, it's set of twos during basketball to get geeky, but I can’t help it. So in basketball what you'll see is you'll see the game being played with one or two players. It's a pick and roll, there's give and go. It’s that kind of thing. In soccer you're playing in threes all the time. You're playing in triangles all the time so it's not just my communication with you but it's how this communication, the ball movement between us, opens up something for that person. So it's not good enough for me to just sit and think of you but I have to think of boom, boom, boom. Boom, boom, boom. Boom, boom, boom. And that's how the game is played. So when I played basketball it helped me at a early age start seeing the game three moves ahead instead of just two. So you know why I'm laughing it up? 'Cause I played soccer. And you're talking about triangles. Hm. Did you hear that? Just dropped that pearl for y'all. Triangles right. You can't escape your triangles right? And we should out of respect for Tex Winter who was a very important person in your life and just recent passed away and so us bringing up the triangle I know that always makes you think of him. We'll discuss the influence of coaches but you did mention one thing and I think maybe it acts as a nice segue, you met a lot of coaches when you lived in Europe that were from the US. Just timing. When I was growing up in Europe a lot of the top coaches had spent a lot of time in Europe trying to expand the game. So you had great coaches, the Red Holzman’s of the world, Red Auerbach’s, Hubie Brown’s, all these great coaches would come and do coaching clinics. So when I was growing up it was like everything was fresh in the coaches’ minds. I was getting all the basic stuff. Footwork, tactics and strategy. We used to have practices where you played full court five on five, no dribbling. I got the basics from all these great coaches that came over the teach the game. How about that. Eight years old. But you know what, you actually mentioned this at the reception. Ticky, tacky, ticky, tacky, right? F.C. Barcelona - that they were teaching you that in basketball. Right. Moving the ball, moving the ball, moving the ball. So it was interesting that the global game of football had that influence on you that moved then into learning from coaches who were also teaching you a similar strategy. So you were already starting to form an opinion, a point of view about how you wanted to play the game but also how you wanted to be coached. Yeah. Well I mean the other thing too is that they didn’t give me anything that wasn't absolutely necessary to have. So it wasn't like they put me in front of a cone and then forced me to dribble with a basketball and then five tennis balls and then do all this spinning and all this 'cause it's unnecessary. They taught me how to think the game first. How to pass with left hand, right hand. Finish left hand and right hand. How to shoot the ball properly. Teach you how to play with others. Then when I came back to the states at 15 I saw these kids doing all this stuff. I was like, "Dang I gotta learn how to do that." So they were just putting the icing on the cake. The coaches gave me the cake.